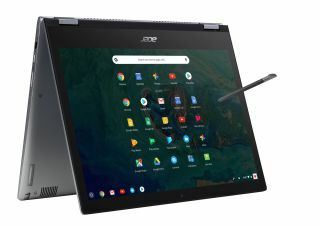 Acer America today announced that two new Chromebooks – the Acer Chromebook Spin 13 and Acer Chromebook 13 – will both be available through the channel to commercial customers in North America starting in September. The Chromebook Spin 13 is priced starting at $749.99 and the Chromebook 13’s pricing starts at $649.99. Both models were designed for business customers and feature an all-aluminum design with a Full HD+ 13.5-inch display in a 3:2 aspect ratio. The Chromebook Spin 13 (CP713-1WN) is a convertible model with hinges that allow it to be opened a full 360-degrees. It includes a Wacom EMRstylus for note-taking, sketching and interacting with the display. The CP713-1WN-385L - 8 Generation Intel Core i3-8130U processor, 8GB LPDDR3 memory and 64GB eMMC storage for $749.99 USD and $1,029.99 CAD. The CP713-1WN-55HT - 8 Generation Intel Core i5-8250U processor, 8GB LPDDR3 memory and 64GB eMMC storage for $849.99 USD and $1,149.99 CAD. The CP713-1WN-59KY - 8 Generation Intel Core i5-8250U processor, 16GB LPDDR3 memory and 128GB eMMC storage for $949.99 USD and $1,299.99 CAD. The CB713-1W-36XR has an 8 Generation Intel Core i3-8130U processor, 8GB LPDDR3 memory and 32GB eMMC storage for $649.99 USD and $899.99 CAD. The CB713-1W-56VY has an 8 Generation Intel Core i5-8250U processor, 8GB LPDDR3 memory and 32GB eMMC storage for $749.99 USD and $1029.99 CAD.